Happy Monday Everyone! I hope you had a wonderful weekend. Whether my weekends are spent being lazy or being productive, I always feel refreshed come Monday when I spend it with the people I love, doing the things that I love. Well.....I take that back - it all depends on if my little one wakes up feeling refreshed (that is usually a good indicator of how the rest of the day will play out). So far the new piece that I added to her room (nursery reveal coming soon) has helped to brighten her morning and start her off on the right foot. 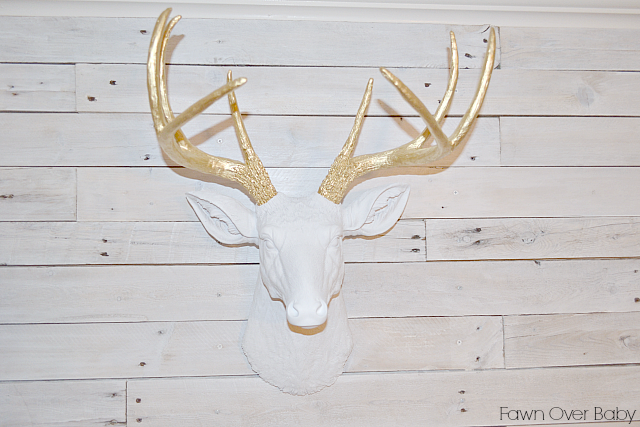 Meet The Alfred - Stag/Deer Head from White Feaux Taxidermy! Have you heard of WFT? If not, you must stop by and browse their amazing faux animal mounts that are offered in a variety of sizes and color combos. When I FINALLY decided on a theme (if you want to call it that) for McKenzie's new room, I knew I wanted to keep it neutral and bright. 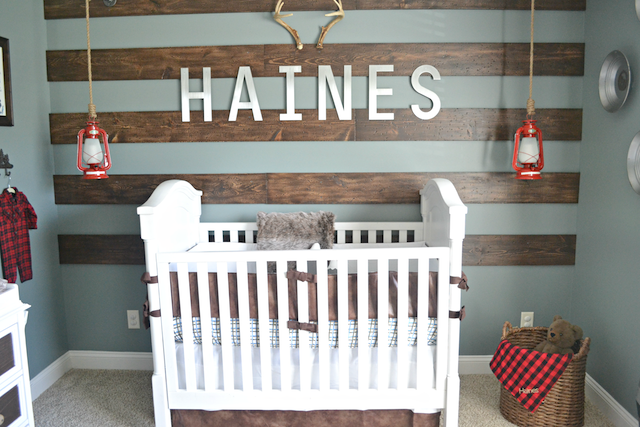 After moving from Alaska, my rustic appreciation came with me and I decided to somehow incorporate it in her room. 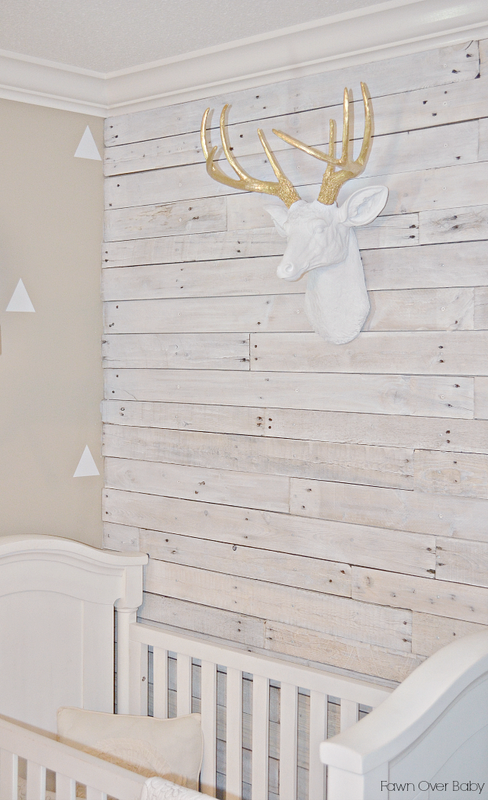 We started with the Pallet Wall (DIY coming soon), then added The Alfred which added even more of that outdoor feel but in a chic and modern way. 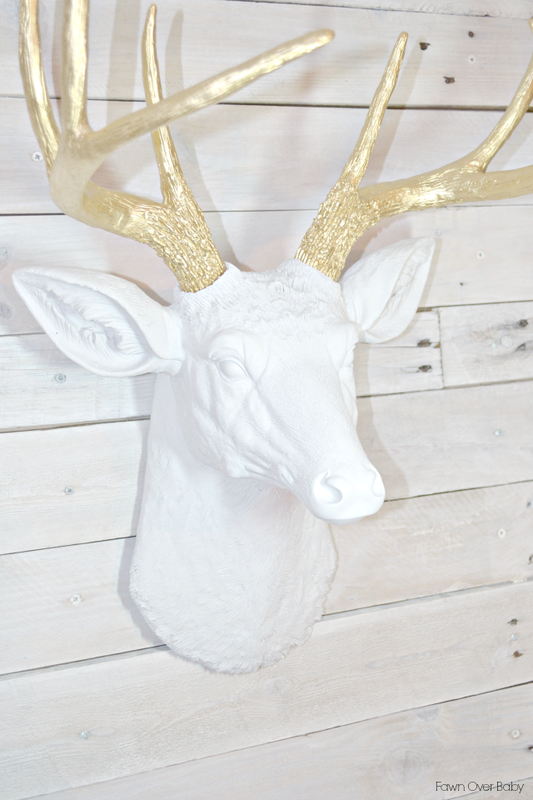 Painted all white with gold painted antlers, The Alfred is cast out of polyresin material allowing for light weight and easy handling. In the mornings when I walk into McKenzie's room, she greets me with her pointing up to Alfred asking "what z aaaaat" with a big smile on her face. She is so thrilled that she gets to wake up to a new animal friend that she normally only points to in the pages of her animal books or puzzles. 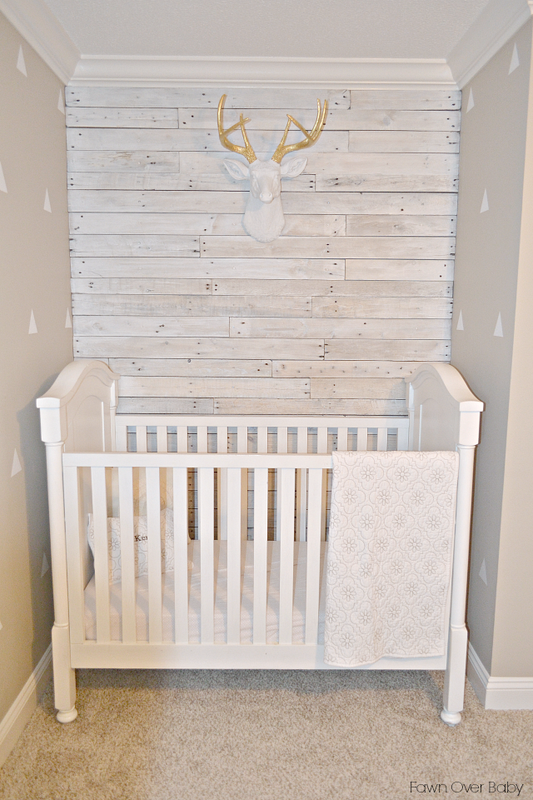 The gold antlers add the perfect amount of shine and sparkle to dress up her cozy little crib nook. To save on space and for protection during shipping, they come wrapped separately/disassembled. However, they are super easy to snap into place and mounting took literally 2 seconds with nail already in place. I couldn't be happier with how well our new animal friend fits in perfectly in our home. The double plus, is that it took no time at all for McKenzie to warm up to him. 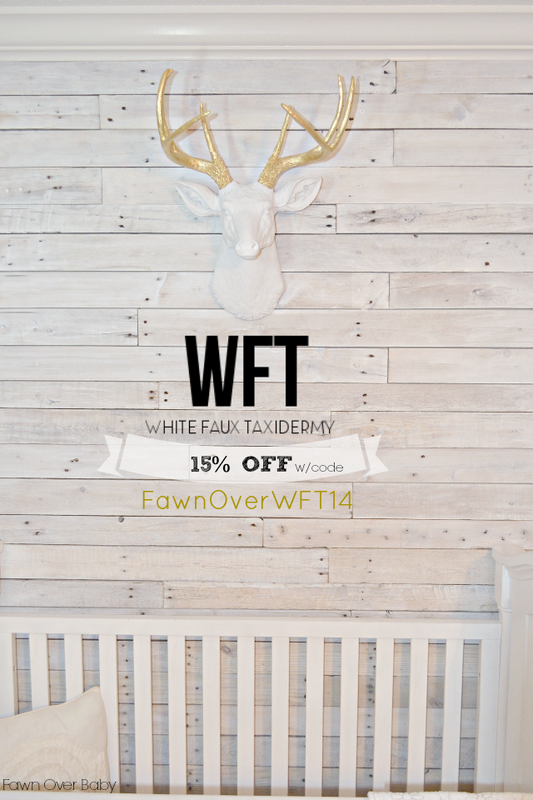 If you would like to add your own fabulous faux animal mount to your home decor, White Faux Taxidermy is offering all Fawn Over Baby Readers 15% Off your purchase today! Simply use code FawnOverWFT14 at checkout and 15% will be deducted from your total!! YEY! Are you as excited as I am? 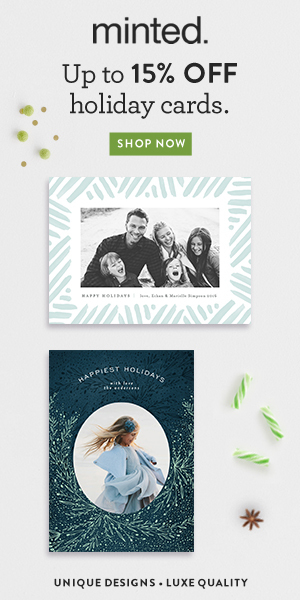 Stop by WFT to pick the perfect match for your space today!